The first half of the week was unpleasant, for reasons I won’t go into – and I was irritable and unmotivated. Aside from work and sessions at the gym, it was quite uneventful. I woke up on Sunday not having slept well at all, Rama cancelled our session and I had to go to brunch at someone’s house. My cousin and I got there just before noon. All the girls who were at dinner at Toscana the week before were there, plus a couple more. Conversation revolved around schools (again), Bollywood movies (again), what the kids are going to wear for their Diwali show, and a couple of other things. I left brunch at 2pm and went over to another friend’s place for a short while – she had been at brunch too and I went to say hi to her mum who was visiting Dubai. I felt brain-dead after brunch and making conversation was an effort. I left after 20 minutes. 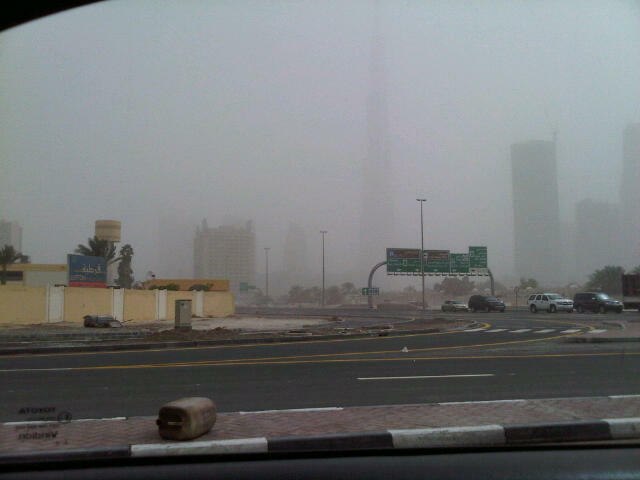 While I was at brunch my mum decided to go to the Mall of the Emirates so I joined her on my way home. She was looking at coffee tables – and I didn’t like any of the ones she showed me. We went home and I sat down to do some work. I didn’t sleep well on Sunday night either. I did manage to get some work done on Monday afternoon though, so that was good. I slept about 4 hours on Monday night/Tuesday morning – I kept waking up and at about 6.30, I was up. I stayed in bed, hoping to go back to sleep for a while but it didn’t happen. I had too many thoughts rushing through my head. I was supposed to meet a friend for coffee that morning but she couldn’t make it in the end. That afternoon I sat down to do some work only to find that the files I’d worked on the day before were corrupted and I had to do the same work all over again. I wouldn’t even be able to charge for it. What a bloody waste of time. I had a session with Rama on Wednesday morning. I sat down to do some work after that but at 4pm I decided to walk to Tim Horton’s for a coffee. I just needed to get out of the flat for a bit. That night my mum, cousin and I went to the Dubai Mall for dinner and to a movie as it was my parents’ 42nd anniversary and my dad wasn’t in town. We had dinner at PF Chang and then went to see ‘Arbitrage’ (I was disappointed by the abrupt end). Things started to pick up on Thursday. That evening I went to Wine Club. As usual there were six wines to taste – one sparkling, two white and three red. There was also a lot more food than last time (thank goodness – I dread to think what state I’d have been in if there hadn’t been enough food to go around). There was a lot of mingling at the bar afterwards and it turned out to be quite a heavy late night. I was a little hungover on Friday but went to meet a friend for lunch. 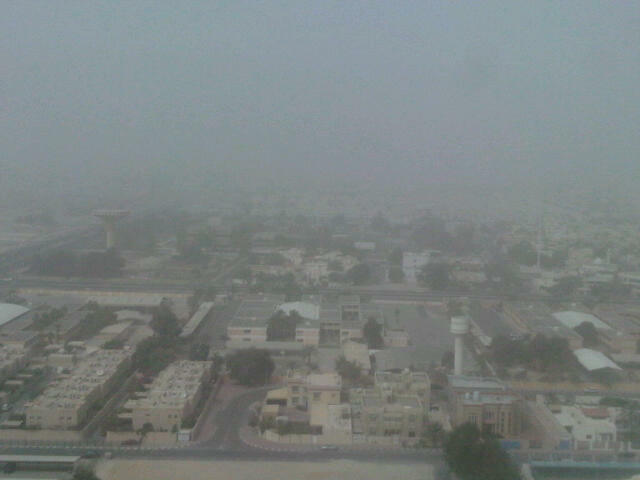 We went to Al Dawaar, the revolving restaurant on top of the Hyatt Regency. It’s a lovely restaurant – there was a variety of food but I went for the hummus, baba ganoush, grilled chicken. And a Bloody Mary, of course. I was supposed to be out for dinner that evening too, but those plans fell through and I ended up staying home. Saturday was a very chilled day. I spent the afternoon by the pool, reading my book. That evening I went to a writers’ group at The Pavilion Downtown. When I decided to move to Dubai I thought I’d have more time to focus on my writing but apart from attending a different writers’ group a few months ago (and just once at that), I’d done f***-all about it. As the time drew nearer I was very tempted to back out but forced myself to go. I’m so glad I did. I got there on time (no thanks to the idiotic cab driver) and there were just four of us to begin with. The organiser told us there would be two writing exercises, each one lasting 30 minutes, and we were to focus on dialogue. He gave us a line of dialogue, an object and a character and we had to start writing. In the first exercise, the line of dialogue was ‘I don’t think that’s how it works’, the object was a bicycle and the character was a teenage girl. It took me ages to get started and I didn’t really connect with the first exercise at all. The line of dialogue in the second exercise was ‘Tomorrow is another day’, the object was a red ball, and one of the characters had to be a grumpy old man. This was much easier for me. In fact, I’m thinking of turning this one into a proper short story. Several people came in after we’d started the first exercise, including a guy who actually said he wasn’t really into writing so would just read his book while we carried on. I thought that was odd. What I liked about the group was that we didn’t have to read out our work afterwards. We could ask questions about any issues we may have faced but we didn’t have to critique anyone else’s work. After the second exercise was finished people hung around chatting to each other. It was a friendly group – 11 of us in the end – and I would definitely go back. They meet every two weeks. The next meeting clashes with a book group I was going to attend but I might cancel that – I think I need to focus on this now. I also really liked The Pavilion – I can see myself spending more time there and it’s not far from home. I got home at about 9pm, had dinner, watched a couple of episodes of ‘Revenge’ and read for a while. I didn’t have my usual session with Rama on Sunday. 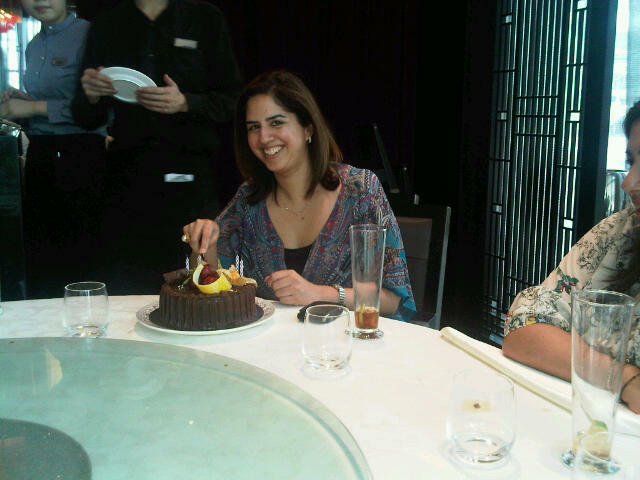 Instead I was invited out for an early(ish) lunch at Siddharta Lounge at Grosvenor House Tower 2. It’s a beautiful restaurant – it reminded me of the Sanderson Hotel in London. It was all white – white bar chairs, white sofas, floor-to-ceiling windows all the way round. It’s a gorgeous venue for lunch, but I’ve heard it’s also very popular on Thursday and Friday nights. After lunch, my mum, grandmother and I went to the Patchi store at Mercato. My grandmother and I both needed to buy gifts for a few people. Unfortunately the store at Mercato was being refurbished and they didn’t have a big variety of gifts on display. I picked up a few things but we decided to go to the store at the Dubai Mall as well. We were there for what seemed like forever. Between us we ordered about 20 boxes of chocolates and waited around for them to be prepared. By the time we got home it was 6.30. I rushed upstairs, changed and freshened up and was out again by 6.45. 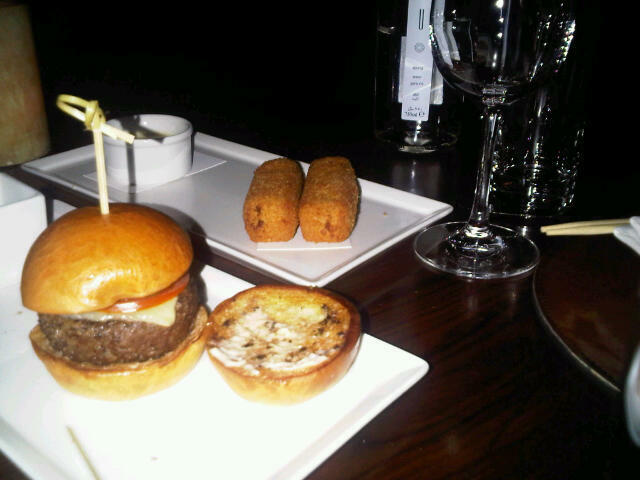 My cousin had asked me to join her and some friends at Capital Club in DIFC for quiz night. I love quizzes so I went along. There were six of us on the team and that particular evening it turned out to be an all-music quiz. My five teammates weren’t very happy about that but I was thrilled about this as I thought my musical knowledge was pretty good. Which is why it pains and embarrasses me to say that we came last. LAST. Out of seven teams. There were eight rounds consisting of eight questions each. The first two rounds were fine (TV themes and Oscar winners) but it went rapidly downhill after that. We were by far the youngest team there and the rest of the quiz seemed to revolve around music from the 1960s and 1970s – and I think my musical knowledge only begins with the 1980s (unless it’s classical music). I hate losing. When I got home and told my parents, they were shocked that we lost too! I had my usual yoga class on Monday and then worked for the rest of the day. I had a lot of work to get through and didn’t want to have to do it when I got to London. That evening we went to a restaurant called Aryaas in Bur Dubai, another vegetarian Indian restaurant. On the menu was a ‘family dosa’ which we were told was their specialty. I have never seen such a big dosa in my life. I don’t even know how they managed to make them so big. I thought the food was just OK – I still prefer the palak dosa at Sukh Sagar! I had a session with Rama on Tuesday and then went to Sharjah with my parents. Our work barely took 15 minutes and we were on our way back home. We decided to stop at Mirdif City Centre for lunch. I’d never been there – it was quite empty compared to the Dubai Mall and it was nice to walk around. We ended up at PF Chang’s. After lunch, I went to the Dubai Mall as I needed to pick up a few gifts for friends I was seeing in London. I also managed to sneak in a quick visit to Gloria Jean’s. I stayed in that night finishing off some work and thinking about packing. I started packing on Wednesday morning. And by that I mean I started looking at my clothes, trying things on, and deciding what to take with me. I left everything I was going to pack on my bed. That afternoon I went to get my hair cut, coloured, highlighted and blow-dried. When I got to the salon I decided to get rid of the highlights and skip the cut. For months the hairdresser kept telling me how ‘terrible’ my highlights were and the colour was all wrong. I was so sick of hearing it I just thought it would be best to get rid of them altogether. I also had a mani/pedi. I went to have tea with my cousin after getting my hair done. She had flown in from India the day before with her husband and one-year-old daughter and was staying at the Fairmont. It was good to catch up, even though it was just for an hour. I went home, finished packing, did some work and then we went out for dinner. 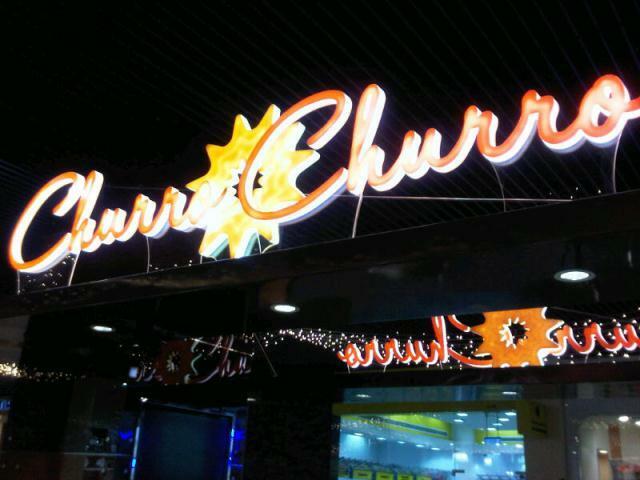 It was my grandmother’s last night in Dubai so we decided to go somewhere nice for dinner. We went to Bice Mare at Souk al Bahar. 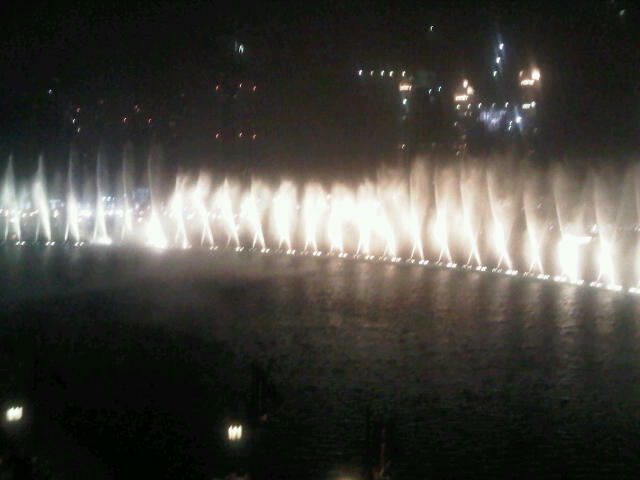 Sadly they didn’t have a table outside but we could still see the Dubai Fountain from our table. The three of them ordered some starters but I decided to have just a main course. 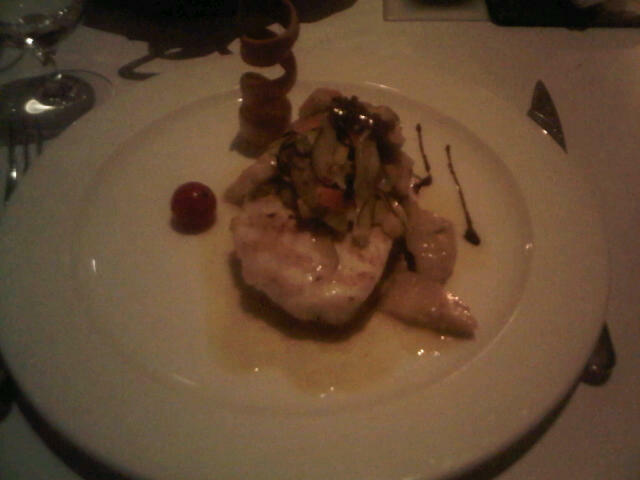 I ordered the baked turbot with artichokes and black truffles. It was fantastic. My parents ordered the seafood platter to share and my grandmother had a vegetarian pasta. When we had finished our meal we went out on to the terrace and watched the fountain. We were home before midnight and I was in bed by 1am. I woke up at 6am on Thursday and my mum and I left for the airport a little after 7am… I couldn’t wait to get to London! I worked all of Sunday and then met my cousin from Bombay and her family for dinner in the evening. Her husband’s cousin lives in Dubai so we met at her house in Marina. I don’t know that area at all and of course I had a cab driver who was most unhelpful. It took 40 minutes to get to her flat – including time spent in traffic – but I got there eventually. It was a nice flat, with a huge balcony where we all sat. The view from one side of the balcony was beautiful, you could see the Marina and the yachts. On the other side, however, the neighbouring buildings were so close I could see what people were watching on TV in their living rooms. We sat around for a while and decided to stay in and order Thai food. It was so good – my no carbs at night rule went out the window. Pad thai, red curry and rice. Yum. I got home just after midnight and went back to work. Crazy, I know. On Monday I had my yoga class and went straight to work. On Tuesday I had a session with Rama and went straight to work. I was aiming to get this book copyedited by Wednesday (even though the deadline was Friday) and I finished it just after midnight. There was still some formatting to do and changes to be made, but there was light at the end of the tunnel. By this point I was so sick of obstetrics and gynaecology, and I was glad there were no images in the book. At one point in the evening I had to read about manual removal of the placenta and wanted to throw up. I couldn’t understand why anyone would want to be an obstetrician and/or gynaecologist. On Wednesday I went to the gym and after lunch Joy and I did the Lulu grocery shopping. It’s a completely pointless task for me – I push the trolley while she goes through her list of things we need. I could do it on my own but as she’s the one who cooks it makes sense for her to choose her ingredients… The only good thing about the trip to Lulu is my ‘treat’ at the till – I buy myself a small bar of Galaxy chocolate! I worked all of Wednesday afternoon and evening. I was supposed to go to an InterNations event on Wednesday night but I decided to just get on and finish my work. Just before 10pm I was done. I spent over 60 hours on that book, plus more hours spent on the work I was doing for two other publishers. But it was finally done. For a while I was worried I’d have to break my policy of not working on my birthday, but luckily it didn’t come to that. On Thursday morning I left my flat at 11 and was met with a wall of heat outside. I was outdoors for no more than 2 minutes but the heat was stifling. Summer had arrived! I had a mani and pedi at the Fairmont, followed straight after by lunch with the girls at Royal China. Earlier in the week I was unsure of being able to go but by Wednesday I knew I’d be free. Conversation revolved around kids, schools, teachers and the weather (it hit 39C on Thursday). One of the girls had organised a cake for me – which was lovely but unexpected! And delicious. I couldn’t remember the last time I had cake. My birthday was nice – it was the first birthday I’d celebrated away from London since 1994. I had a relaxing morning after the manic work week I’d had. My dad’s brother had invited us to lunch with his family so we all went to PF Chang at the Dubai Mall. Being a Friday, it was packed and we had to wait an hour for a table. By the time we sat down we were all famished and over-ordered and subseqently ate too much. After lunch Dad and I went to Gloria Jean’s for coffee and then to du to sort out my phone. I’d been using a pay as you go number since December, and buying top-up cards every time I ran out of credit. I thought it would be best to switch to a regular mobile contract – partly because I kept forgetting to top up the credit for the BlackBerry service. The guy in the store was helpful and said that my phone would be out of service for about 2 hours. I was still getting calls and messages from friends so I asked him if they could do the change over the following day instead. He said it wouldn’t be a problem. 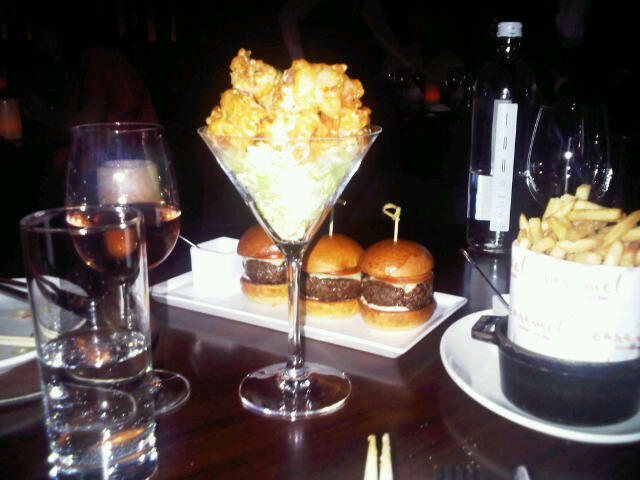 That night Dad and I went to Zuma for dinner. We had the edamame, tuna tatake, rock shrimp tempura, ohitashi, and black cod. And then ordered another portion of the tuna tatake. I had two glasses of wine. I usually order a chocolate dessert but that evening I ordered the green tea and banana cake – I’d never tried it before and I’d go back just to have that. Amazing. We were home by 11pm and soon after midnight my phone stopped working. No calls, no BB Messenger, no texts, no Twitter, nothing. A couple of hours later it still wasn’t working. I went to sleep and woke up and it still wasn’t working. It was starting to piss me off. I called du and was told that it could take up to 24 hours for the change over to complete. TWENTY-FOUR HOURS without a phone? Were they mad? I went to the gym, came home, had lunch, went down to the pool with my book for a couple of hours, came back up at 5.30pm and it STILL wasn’t up and running yet. That evening I managed to arrange dinner with a friend who was visiting from India. We met at MoE and decided to go to PF Chang. I’d eaten there the day before but I didn’t mind as I fancied the steamed salmon with ginger which we didn’t have the previous day. I had a healthy dinner of steamed dumplings, steamed salmon and brown rice, and I was home by 10pm. My phone started working shortly before midnight – but if anyone had tried to reach me on Saturday I wouldn’t even know as none of those messages or missed calls came through. So those of you that didn’t call on Friday (and you know who you are), if you tell me you tried to get through on Saturday and couldn’t, I may actually believe you. Then again, I may not. Not a terribly interesting week! I woke up on Sunday not feeling very well and had to cancel my session with Rama (which I really didn’t want to do). I went back to sleep for a couple of hours and felt much better when I woke up again. I stayed home most of the day and then met my cousin for a coffee. She was visiting from Bombay and I hadn’t seen her in over a year so we went to Starbucks at the Dubai Mall and sat outside. It was nice and I think the fresh air did me good. We were supposed to go out for dinner that evening but when she got home after the mall she wasn’t feeling very well and in the end my parents and I went out for dinner on our own. We went to Thai Chi at Wafi Pyramids. I didn’t take any photos, but the buildings there are in an Ancient Egyptian style – the gym is called the Pharoah’s Club, the coffee shop is Rameses, the beauty salon is Cleopatra’s, and so on. Thai Chi is on the first floor – it’s a huge restaurant but being a Sunday night it was quite empty apart from one or two other tables. The food was good, the portions are huge. My parents and I shared a tom yum soup – which was supposed to be shared between two people, but there was enough there for four large bowls of soup. We then had one of the salads and some chicken satays. For our main course we had a beef dish and a green chicken curry. It was more than enough for the three of us! On Monday I had my first yoga class with the new teacher. I was home working for the rest of the day and that evening my cousins came over for dinner. My parents were out with their friends so we had the place to ourselves. I woke up on Tuesday feeling unwell again – and stayed home all day. I didn’t feel great on Wednesday either but went ahead with my session with Rama. On Thursday, I met up with a friend at More Cafe at MoE. I’d met her a couple of times since moving to Dubai but it was always with a group of people. This time it was just the two of us and we got to catch up properly. We met at 11.30, had brunch, and when her daughter was done with school, she joined us too. What was supposed to be a quick breakfast/coffee turned into a 3-hour session. I stayed home that night – I had some work to do and I was tired. On Friday, I met up with the same friend for lunch. We had a mutual friend in town for the day from Bangalore so we went to Wafi Gourmet. The service was atrocious. It seems to get worse each time I go there. After our long lazy outdoor lunch, our friend from Bangalore wanted to go to a supermarket so we ended up at Choithram’s in Jumeirah. We went home after that and she left for the airport. That night I had dinner at PF Chang with my parents. I felt like I’d spent the whole day at the mall by this point. My cousin joined us as we were finishing and we went to see ‘The Iron Lady’. Dad wasn’t happy when he found out what we were seeing (we hadn’t told him) – basically if a movie doesn’t involve high-speed car chases or people shooting at each other, he’s not interested. As expected he didn’t like the movie. I thought it was a bit slow, but I thought Meryl Streep was amazing. There were times, however, when I felt she looked a little like one of the characters in ‘Little Britain’. I think it was her hair or make-up, possibly both. On Saturday, I was home most of the day as my mum was leaving for India. I met up with a friend at Caffe Nero at the mall – I was telling her about my photography course and she suggested I brush up on my skills and start doing sessions for the kids’ play dates. She said they’re always looking for photographers for the kids – and that it would be worth my while. I’m not sure how I feel about spending time with toddlers. In fact, it’s not the kids that worry me, it’s their mothers that might freak me out! But I said I’d think about it (which I am)… Anyway, we spent an hour together and that evening I stayed home as I had an early session with Rama the next day. So that was week 7 – hardly any exercise, lots of work, and not much else! On Thursday afternoon I decided I really needed a manicure and pedicure. I went to the salon at the Fairmont where I’ve been going for the last few weeks. Oh, that’s one thing that really annoys me: in Dubai, they say ‘saloon’ rather than ‘salon’. It is SO irritating. Am I going to find the fastest hairdresser in the Middle East? I don’t think so. But I digress. Being a Thursday I thought I’d go earlier rather than later. When I got there, I was surprised to find I was the only person there. I sat down, one person did my hands, another did my feet. The rest of the girls were chatting in a corner, giggling and laughing. I tweeted: ‘I want to learn Arabic but after sitting in this salon for the last hour I think Tagalog might be the way to go.’ Maybe I should learn both? On Thursday evening, I had dinner with my parents, sister and a couple of my parents’ friends. We met them at The Address where they were staying, with the intention of going to PF Chang’s at the Dubai Mall for dinner. 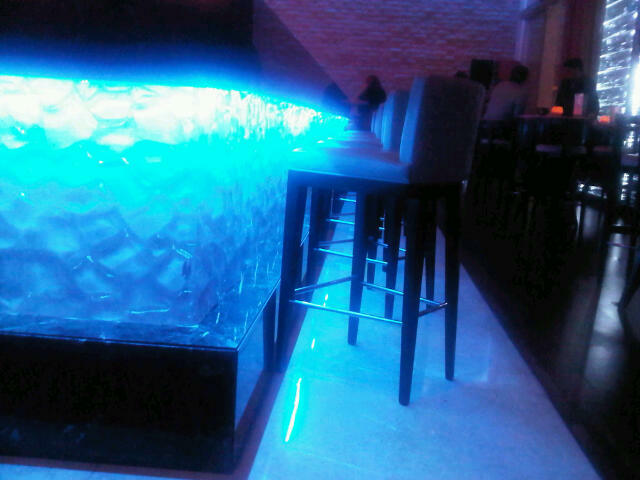 We walked through the hotel to get to the mall and had to walk past Ember Bar and Lounge to get there. We decided to stop for a glass of wine before dinner. After our bottle of Pinot Grigio we carried on through the mall, but when we got to the restaurant there was a long queue outside. We were told it would be at least 45 minutes until a table for 6 people became available. We put our names down and a couple of us headed to Waitrose and the chemist while the others waited near the restaurant. We didn’t sit down until 10.45. I was pleasantly surprised by the food – the dynamite shrimp were excellent, and I ordered steamed salmon with vegetables as a main course but couldn’t finish it. It was just before midnight when we left the mall – and the shops were only just closing at that time! I had my photography class on Friday afternoon. When I was finished, I was on my way to meet my mum, sister and nephew, when I saw a little boy – he was probably about 4 or 5 years old and he was bawling. I looked around but couldn’t see anyone who he could have been with. ‘Are you lost?’ I asked him. He just carried on crying. ‘Where’s your mummy?’ I asked him. He shrugged, still crying. ‘Should we go find her?’ He nodded. I looked around for an information desk and saw a security man – so I took the little boy over to him and told him he was lost. The little boy seemed a little calmer by this point but I didn’t really want to leave him alone with the guy so I walked with them as he spoke into his walkie-talkie. Two minutes later, the boy’s mother found us – and she was walking towards us from the complete opposite direction to where the boy had been. I don’t know how long he’d been lost, but she seemed more annoyed at him for getting lost than relieved to see him safe and sound! Anyway, at least they found each other. 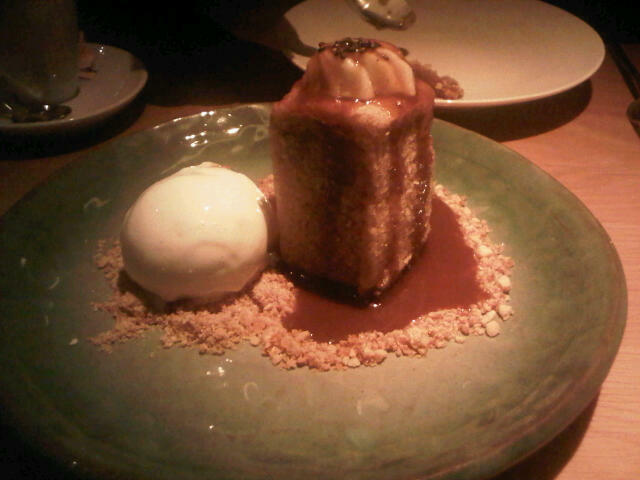 On Friday evening, my sister and I went to Caramel for dinner. We got there just after 9pm, didn’t have a reservation, but got a table straight away. We were told they’d need it back at 10.15. We sat down, and as soon as I looked at the menu I knew it was going to be a ‘cheat night’. We ordered a few small dishes, and one main dish – all to share. Talk about carb-fest. I felt quite gross after that! And we had two glasses of rosé each. We sat at our table till after 10.30 – and nobody asked us to move as there were several empty tables around. On Saturday I was home all day after going to the gym in the morning. It was cold and windy all day and I could hear the wind howling outside. My mum and sister were out shopping all day while Dad and I entertained Vinay at home. He was hard work, wanting to watch ‘Wheels on the Bus’ on the iPad or laptop over and over and over again. As it was my sister’s last weekend in Dubai, she wanted to go to a Japanese restaurant for dinner. 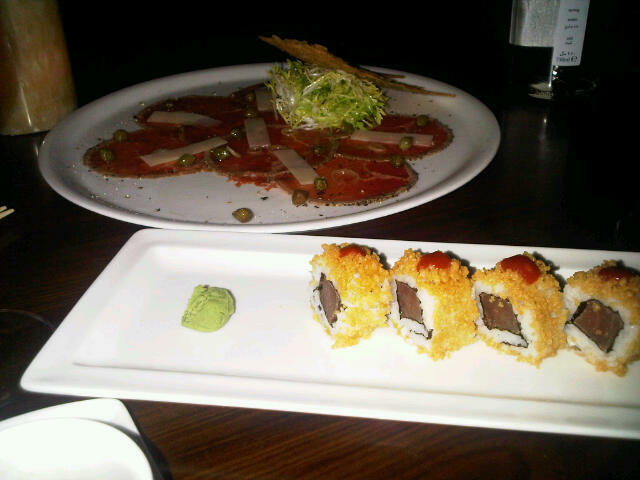 We ended up at Sakura at the Crowne Plaza on Sheikh Zayed Road – close to home. The service was a bit slow, but the food was good when it eventually arrived! I ordered a salad to start with – it was one of the biggest salads I’d ever seen. At least three people could have shared it as a starter. I ordered the salmon teppanyaki for my main course – without rice. The food is good and the portions are generous, but there’s not much choice if you’re vegetarian.